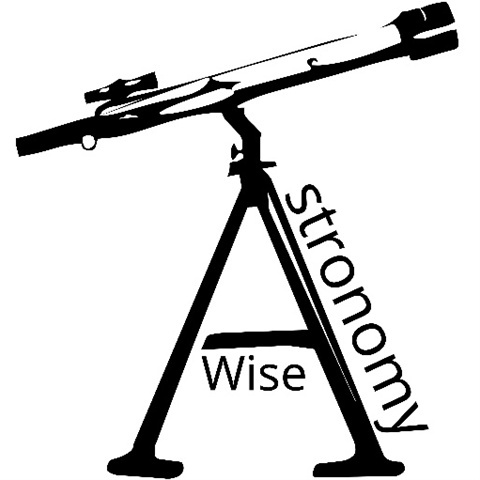 'Astronomy Wise' is the name of a group of internet and amateur astronomers whose aim is to promote popular astronomy in their areas. I am happy to be associated with them, as this has always been my desire too. They have indicated their willingness to help in the public observing occasions that are announced on this site. For a while they held regular monthly observation nights at Sawdon, to the west of Scarborough. Information from them will appear on this page as I receive it. The chief aim of ASTRONOMY WISE is to make people 'wise' in all aspects of Astronomy, and I hope that what you see here helps. So this is very much the EDUCATIONAL SECTION of my Site! CYGNUS, the Swan is a constellation of the Summer and Autumn skies it culminates (crosses the southern meridian) at a point almost overhead (at the zenith), around Astronomical Midnight (1 am BST) at the end of July the constellation directly to the west (right) is Lyra, the Lyre, lying at a greater distance to the east (left) are the four stars making up the great autumn 'Square of Pegasus'. During autumn and the early winter , Cygnus, with outstreached wings seems to be flying straight down towards the North Western Horizon and its main stars then look like an upright Calvary Cross, which has led many to call Cygnus, 'The Northern Cross'!. 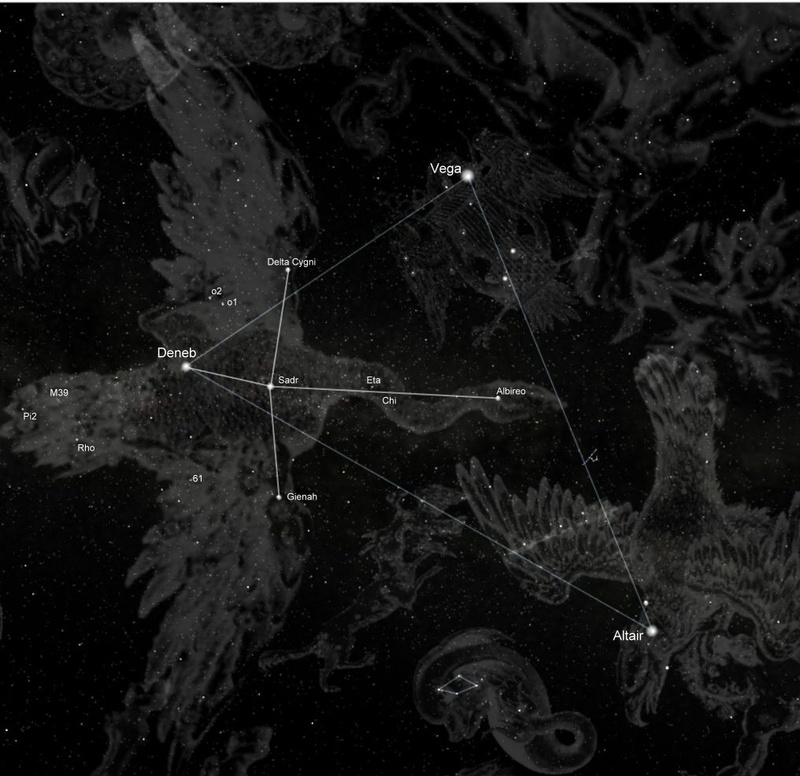 Deneb, 'The Tail' of the Swan is the constellation's brightest star, and when connected with the much brighter Vega in Lyra, and Altair, brightest star in Aquila, the Eagle, the asterism formed by these three stars is known as 'The Summer Triangle', a term first used by Sir Patrick Moore. 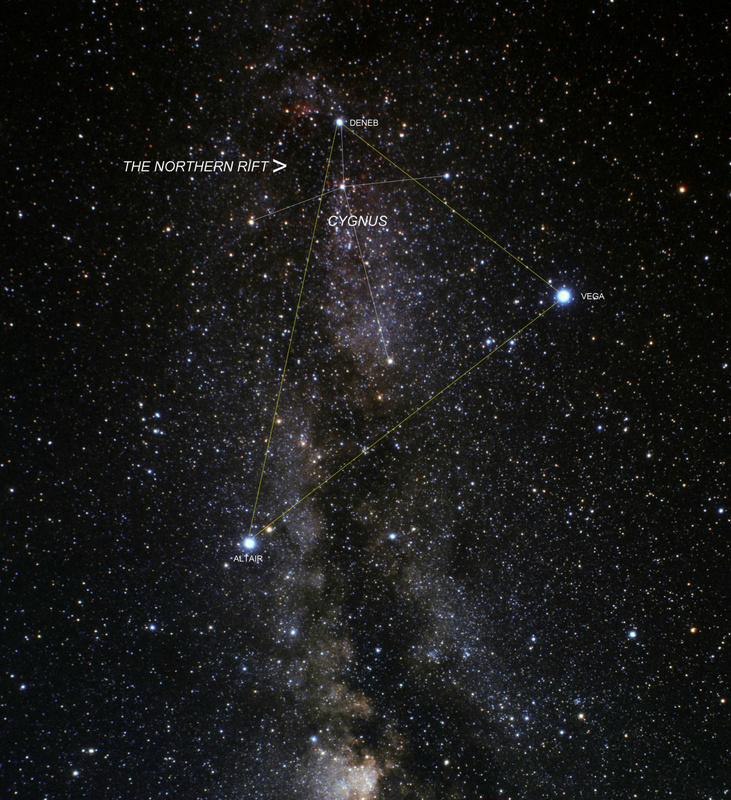 I have connected those three bright stars on the picture below for you to see the Summer Triangle asterism. Cygnus is embedded in the Milky Way, which is very rich in this part of our galaxy, and the view of countless stars is magnificent in binoculars. You will notice also in this area on a dark, clear night, a dark dust lane in the Milky Way, which hides part of the Milky Way which would otherwise be seen. this dust lane which runs to the east of the Stars Deneb, Sadr and Albireo is sometimes called the 'Northern Coal Sack', the counterpart of the 'Southern Coal Sack', a similar but smaller area of dark dust adjacent to Crux, the 'Southern Cross'. From here the Galaxy appears to be divided into two by the rift all the way down to the southern horizon. These areas of darknes are frequently referred to as 'dark nebulae'. 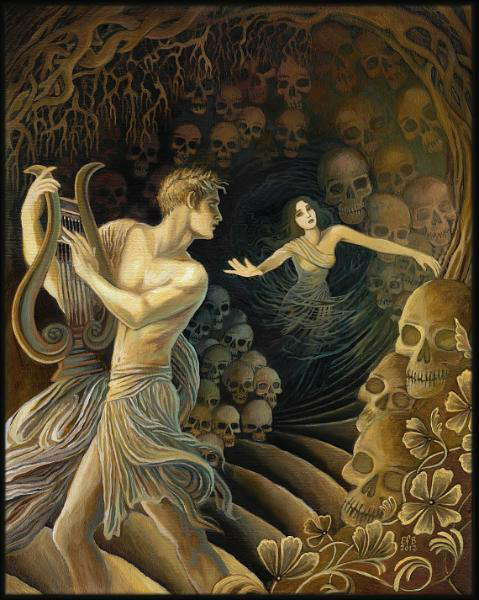 After his wife Eurydice died Orpheus charmed death with his Lyre, and was allowed to take his wife back to the upperworld again, on the condition that he did not look back to see if she was following. However he did look back and so Lost Eurydice forever. After this he would never play his music again and after being killed by a gang of women was changed into a swan where up among the stars he and his beloved Lyre can be seen for ever. Several classical myths tell of a swan. In one such tale Zeus, the King of the Gods, took this form to seduce , Leda, wife of the King of Sparta. As a result of their union two eggs were laid. from one hatched the beautiful Helen of Troy, and from the other the inseperable twins, Castor and Pollux. Another ancient story identifies Cygnus as the musician son of Apollo, Orpheus, who, on being torn to pieces by a gang of ferocious women was placed in the sky in the form of a swan. The sky god placed him next to Lyra, his beloved lyre or harp, amongst the stars. DENEB (Alpha Cygni) This is the constellation's brightest star, and marks the 'head', or ''top ' of the Northern Cross. 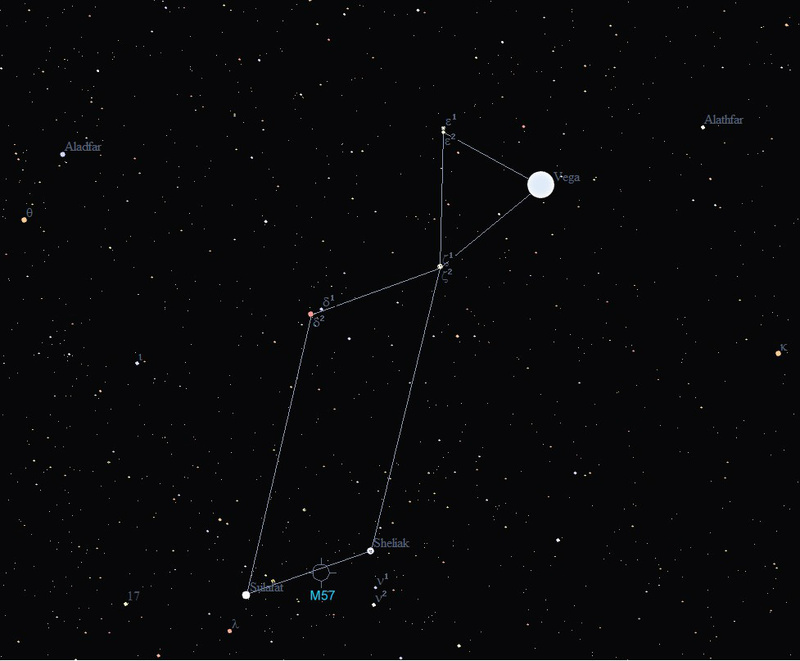 At visual magnitude 1.26, it is the faintest star within the 'Summer Triangle' asterism. Yet Deneb is one of the most luminous stars in the entire sky with a luminosity 60,000 times that of the Sun. It is the great distance of an estimated 1.600 light years, that dims its light. 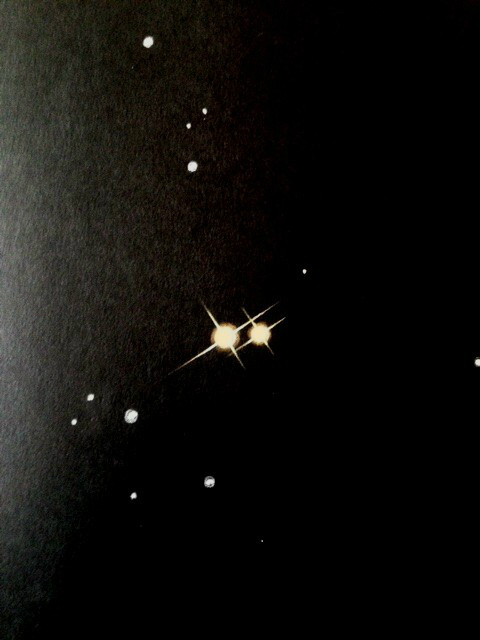 ALBIREO (Beta Cygni), at the 'foot' of the 'Cross' is one of the most beautiful 'double', or binary stars in the skies. the two stars are of visual magnitudes 3.1 and 5.2, and the colour contrast between the two stars is striking, hence the beauty of this pair. The brighter star is of a deep yellow colourand the fainter star appears to be pale blue. good firmly fixed binoculars will split the pair which are separated by 34 seconds of arc. However, the colour contrast is only evident clearlywhen seen through a telescope, especially if you put the stars, slightly out of focus. THE NORTHERN COAL SACK. Starts in Cygnus and heads south to form a great rift in the Milky Way, as the Galactic centre is reached. 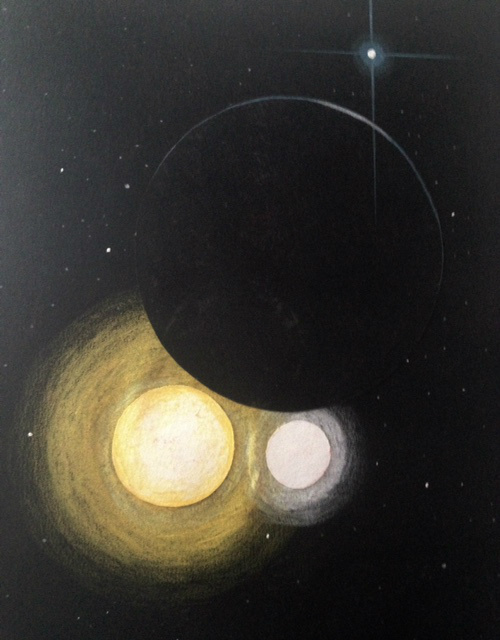 The ALBIREO System, hypothetical view. 61 Cygni. This is a very fine Binary star with two yellow components visible in small telescopes, but not unfortunately in binoculars. The two components are of equal brightness and are separated from each other by a distance of about 84 astronomical units (1 au is the mean distance from Earth to the Sun) the angular separation is 28 seconds of arc. Historically this star , which is one of the nearest at 11.1 LYs.,was the first star, after the sun, to have its distance measured by the astronomer Bessel in 1838. he used the trigonometrical parallax method, i.e. recording and measuring the angular displacement of the star againt the background distant stars. Observations to facilitate this were made of the stars angular displacement when observed six months apart. the base line being the diameter of the Earth's orbit. Although it appears as a star of visual magnitude 5.5, it is worth finding because of this historical connection, also because it is a fine binary in a telescope and because it is one of our nearest stars visible from the northern hemisphere. 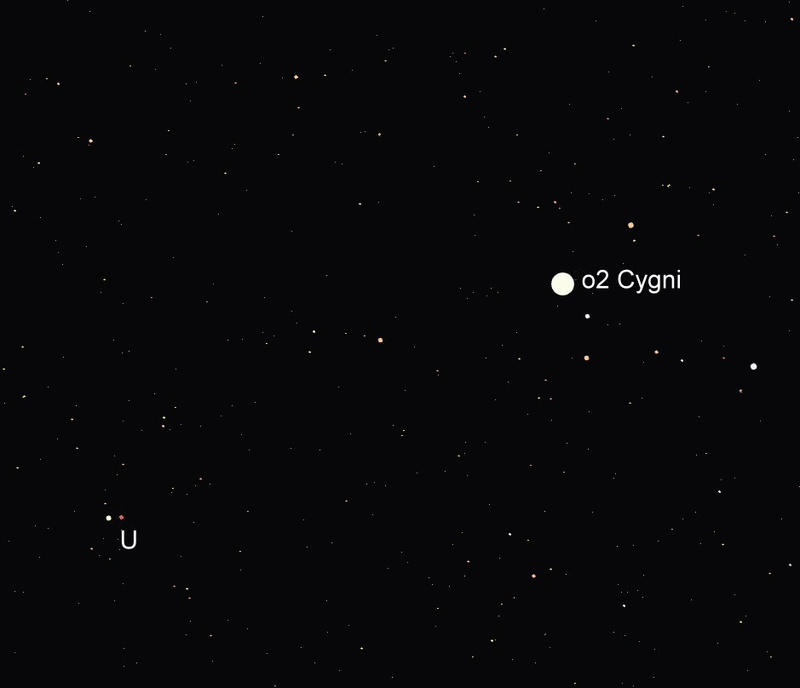 To the west of Deneb and appearing above the constellation's brightest star in the last map of Cygnus, are the stars Omicron 1 (o1), and Omicron 2 (o2) Cygni. Both lie some 4 degrees from Deneb.You should take a good look at this area through a small telescope because of the many coloured stars hereabouts. Omicron 2 is a wide triple star, consisting of magnitude 4, 5,5 and 7.5 stars. the 4th magnituse Omicron is an eclipsing variable star, with a period of 3.15 years, when one star passes in front of the othercausing an eclipse which lasts for 11 days. A little more than a moonwidth to the east of o2 is the variable star U Cygni,with a deep red colour. This carbon star is, in my opinion, the deepest red star in the entire sky, enhanced by a bluish white companion nearby. Find U Cygni and see what you think! There are many other fine objects in this constellation , ranging from areas of nebulosity to several galactic clusters. 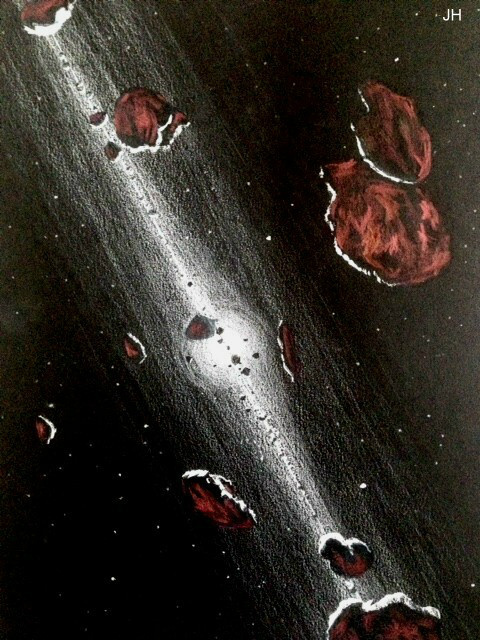 and there are a couple of meteor radiants within the constellation's boundaries, including one which peaks around the time of the Perseids in August.So, if you see a number of meteors not originating from the Perseus area, then in all probability they will be CYGNIDS ! Lying just to the west of Cygnus, we take a look now at this small but significant constellation which is so closely linked in classical mythology with the previous constellation. To the west of Lyra is Hercules, and to the North is Draco the Dragon. Lyra has three prominent stars: The brightest is Vega, which is in fact the second brightest star north of the celestial equator, second only to Arcturus which sparkles over towards the west. 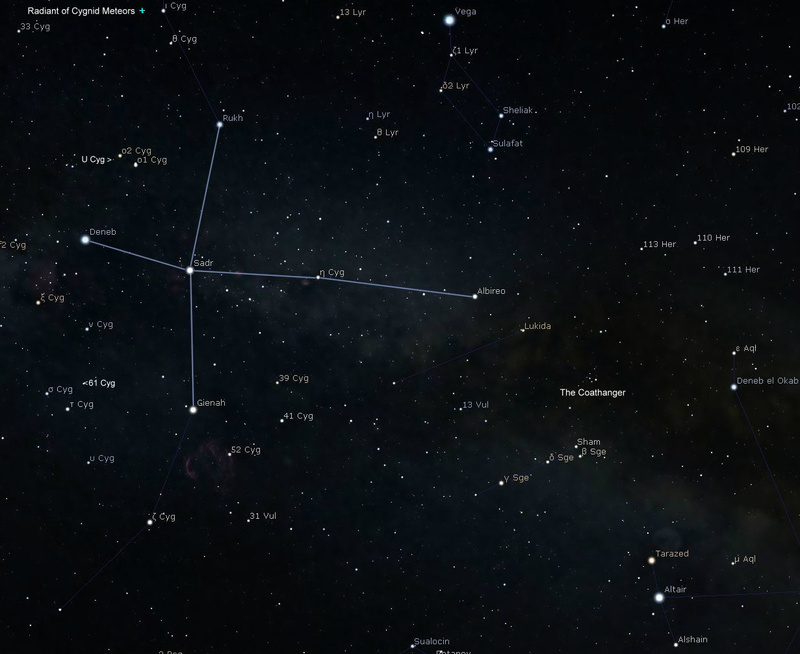 Vega is Alpha Lyrae in the Bayer classification, which consists of a letter from the greek alphabet followed by the genitive form of the constellation So Alpha in Lyra becomes Alpha Lyrae. The other two prominent stars but at a far lower magnitude than Vega, are Sheliak (Beta Lyrae) and Sulafat (Gamma Lyrae). Both lie to the south of Vega.Lyra is a summer constellation, culminating ( crossing the south meridaian, near the zenith at astronomical midnight during the first few days of July. 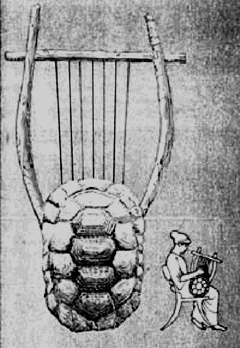 The LYRE, invented by HERMES using a tortoise Shell. The Lyre or Harp, according to classical mythology, was the instrument created by the Messenger God, Hermes (Roman = Mercury), from the shell of a tortoise. Hermes used it to bargain with Apollo, for a herd of cattle he wanted. 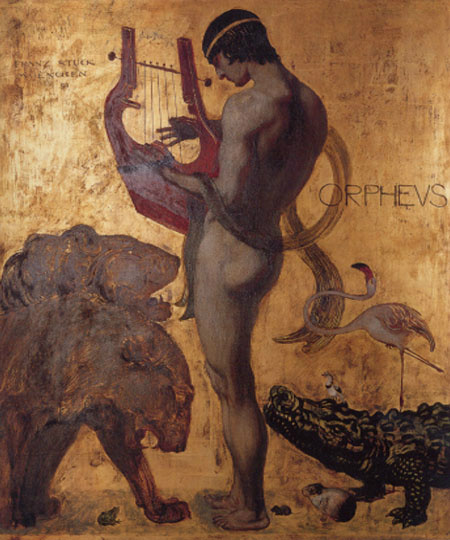 So, the Lyre, fell into the hands of the God of Music Apollo gave it to his son Orpheus, who played the instrument so well that all animals and even inanimate objects, including Death itself, fell under the spell of the music Orpheus played. When Orpheus had been torn to pieces by a pack of wild women, both the Lyre and Orpheus were placed in the sky, amongst the stars, where they may still be seen to this day. 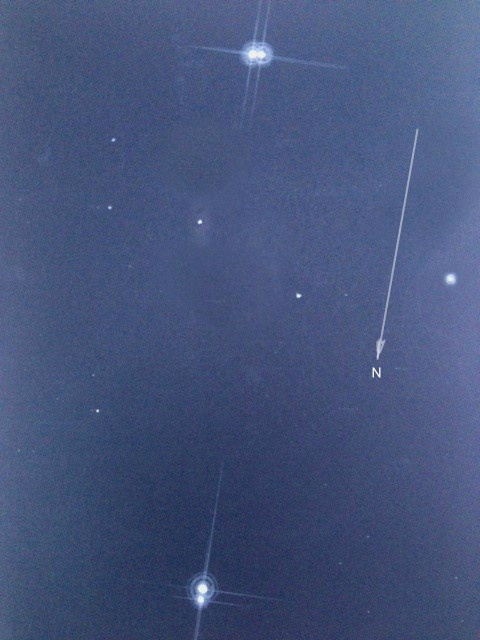 Vega is the second brightest star in the northern sky, and shines at a visual magnitude of 0.02 with a bluish white light. In a telescope it looks just like an 'arc light'. Check it out ! This star lies 26 light years away and has a luminosity 50 times that of the Sun. Vega has a diameter three times that of the Sun, so is approximately just under 3 million miles in diameter. Alpha Lyrae has a surface temperature of some 9,200 degreees K, but its density is only 2/10 that of the sun. Last century, it was discovered that there was an accretion disc, surrounding this distant sun, which indicates the possibility of planetary formation in the future. It is towards this area of sky (actually, a point on the Lyra/ Hercules border) that the Sun and planets are currently moving, at a rate of about 13 miles each second in time. This point is called the Solar Apex, or The Apex of the Sun's way. Just over 12,000 years ago, Vega was the Northern Pole Star, and it will be so again in another 12 thousand years. 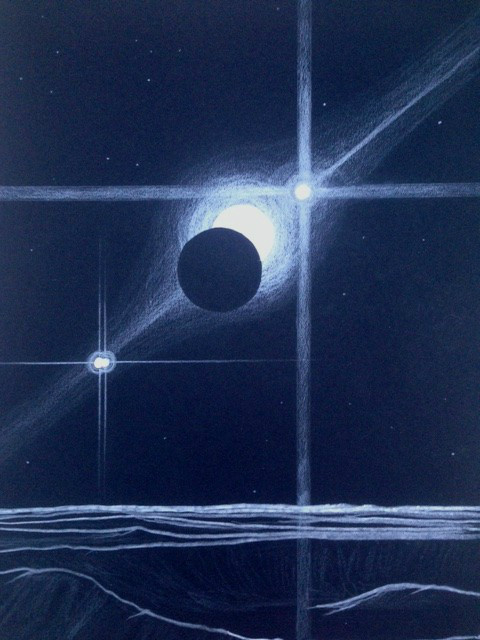 At that time the Southern Cross will be visible from our British skies. All this is due to the Precession of the Equinoxes, a wobble in the axis of rotation of the Earth with a period of some 25, 800 years. 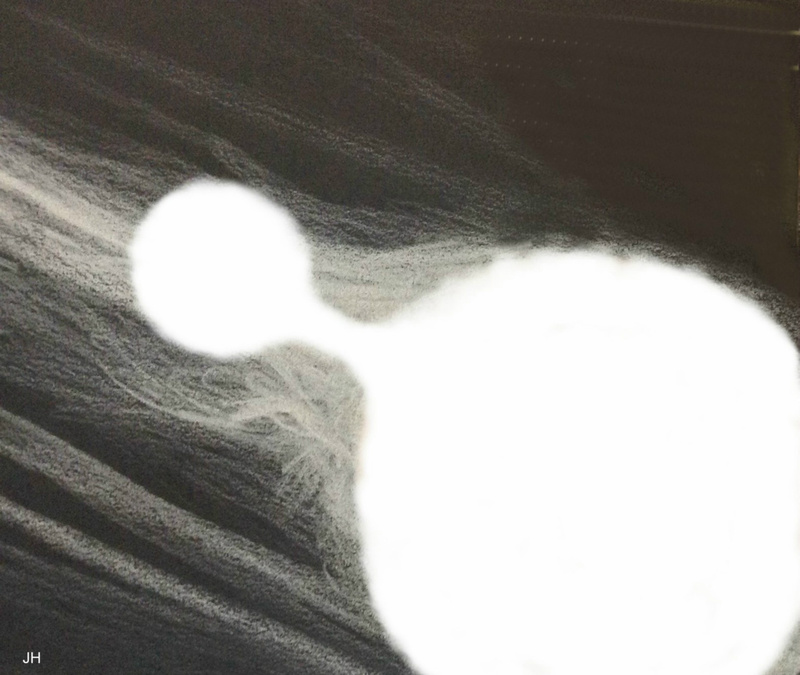 Vega's Accretion Disc, an area of future planetary formation ? SHELIAK (Beta Lyrae, together with SULAPHAT(Gamma Lyrae), have names which translated refer to the tortoise or turtle shell out of which the original lyre of Hermes was made. Sheliak is a most interesting star of the eclipsing variable type and its variability is noticeable if you compare it with Sulafat, to the east ('left', in the northern hemisphere). Both stars lie beneath bright Vega so you should have no difficulty identifying them. 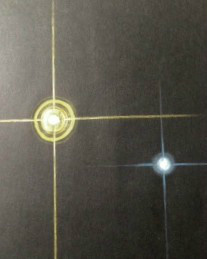 Sheliak's period of variability is from visual magnituse 3.4 to 4.1,with a secondary minimum at 3.8. This variability is accomplished in 12 days 21 hours and 45 minutes. this fading in brightness can be seen by comparing it with its neighbour Sulafat of equal brightness. Every 13 days Sheliak drops to about half the brightness of Sulafat with a secondary drop in brightness six days later. the component stars are close together, estimated to be about 30 million miles (1/3 the Sun to Earth distance) and there is gas exchange between the two stars. More stars of the Beta Lyrae type have been discovered since John Goodricke was the first to observe Sheliak's variiability in 1784. Please click to enlarge if necessary. 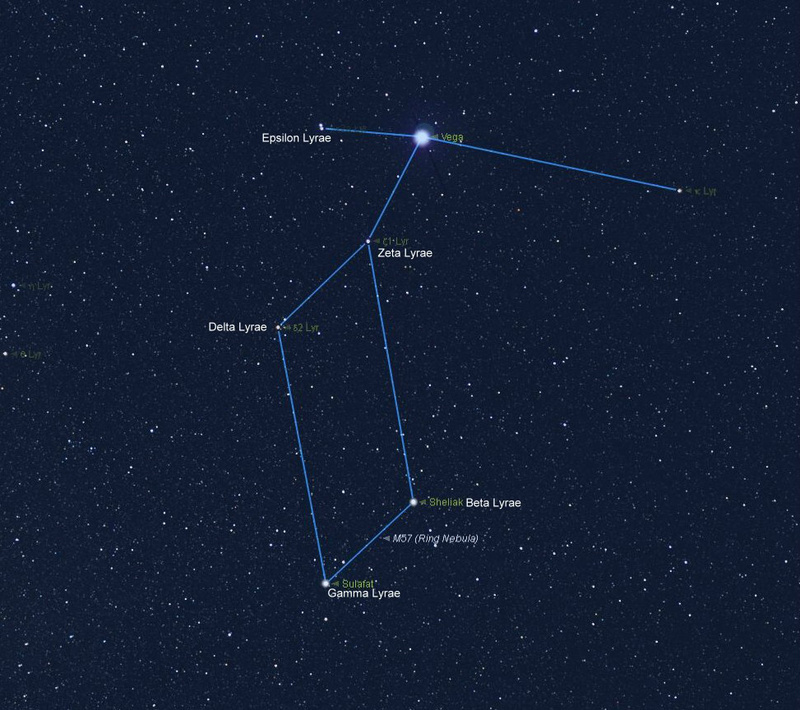 Epsilon Lyrae is one of the most striking binary systems in the night sky, and is more popularly known as the ' DOUBLE DOUBLE STAR'. 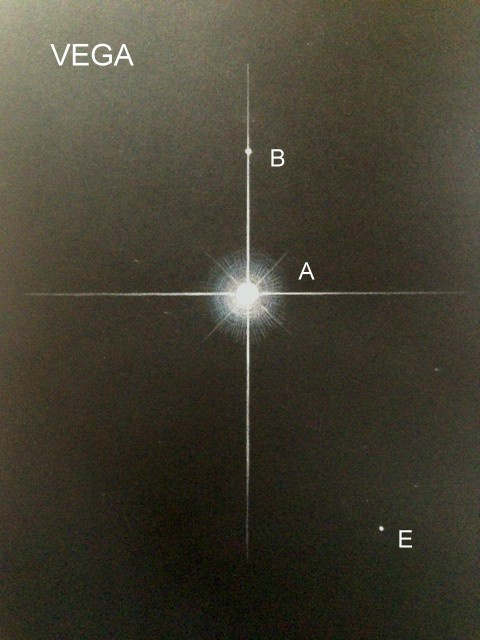 A person with excellent eyesight will see Epsilon as a close 'double star' consisting apparently of two stars of visual magnitudes 4 and 5, with a separation of 3.5 minutes of arc. Binoculars will show the pair clearly. However a small telescope will reveal that both Epsilon 1 and Epsilon 2 are themselves double, their respective angular separations are 2.9 and 2.3 seconds of arc.